Weather resistant open-weave fabric cuts almost 85% of the light to keep you cool and comfortable without blocking your view. Fabric construction is a woven 100% polyester with a durable vinyl coating. 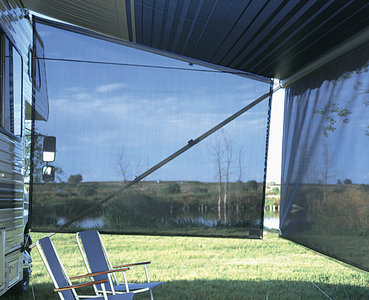 SideBlockers add all-around protection and daytime privacy while blocking sun from the side openings of your awning. Set-up is easy on either end of your awning. Includes a convenient storage bag. Stakes and cords included. 6' Drop.